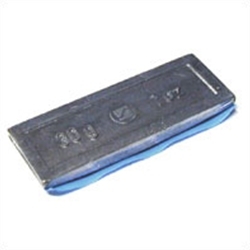 361-2 Type Zinc Adhesive Wheel Weight 30g Box of 25. The weights have a height of 3.8 mm (incl. tape) and a width of 19 mm. These weights are used as series parts at VW, Volvo and Opel. They can also be fitted to other brands, if there is sufficient clearance between brake and rim.